I was trying to figure out why the girls have been having such nasty nights a few weeks ago, and I figured out it's because these poor girls were working on popping those first teeth! They've were drooling and chewing like crazy, and their poor gums were so swollen. And then finally they popped their first little teeth! Just tiny little bottom teeth and I'm so excited #momthings lol! It's so cute! The only thing that has been soothing them throughout their teething struggles since the get go has been Elephant Shoe Teething Co.'s teethers and soother clips! 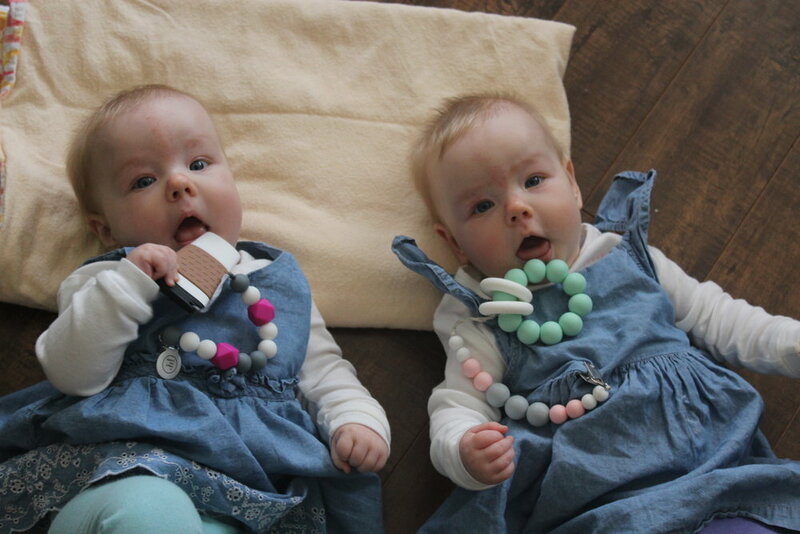 Their donut teethers are freezer safe which the babies have LOVED, but the Coffee Teether has been their number 1 love, along with their soother clips! The Coffee Teether is SO easy for their little hands to hold on to and chew on, plus it's super stinking cute. I love the soother clips because both my girls are super into feeling different shapes with their little hands, and the geometric shapes are so much fun for them. Not to mention they can chew on them too! And again, they're SO STINKING CUTE. We literally never leave the house without them! As a bonus, Elephant Shoe Teething Co. is turning 2! If you hurry, you can get 25% off with code "2YEARS" until Friday, April 28th 11:59 CST! Hurry hurry hurry! Visit their Instagram and website to see where you can find them locally this spring! Otherwise, you can order online! Hope you're all doing well, lovelies! Take good care! Annie & Sybelle: 7 Months!